A make-up artist is an artist that uses human skin as a canvas and make-up as a medium. They apply make-up and style hair for fashion and photographic models, actors and other performers involved in stage, film and television productions, as well as brides and other clients for special occasions. Make-up artists interpret the make-up requirements of clients to produce both a creative and technically accurate visual representation. This may involve very basic make-up for a TV presenter through to more complex period make-up or special effects. standing by on set to redo make-up and hair. What do you do for a living? I am a hair and make-up artist and work with different production companies, for magazines, weddings and personal clients. My job is to make up and style the model according to the client brief. Why did you choose this profession? I’ve loved art and cosmetics since childhood. I helped a friend of mine to do make-up on set and discovered that I could make money just by making people look beautiful. That got me thinking and I decided to join a beauty college. Where did you train? I started with a cosmetology course at Pivot Point in Kenya. Then moved to South Africa, where I studied art directing for Motion Pictures at City Varsity. Describe a typical day I am never in the same place for long. Some days start early – maybe at the beach for a morning shoot – other days I am on set doing a fashion shoot with a magazine, or shooting a cooking show. I could work for only three hours or for 21 hours, depending on the nature of the job. Experience versus formal training? They say that Picasso did not become great because he was talented, but because he put his gift to use every day. It’s the same with this career – experience will get you further. It is important to go to school and learn the basics, but more important to get out there and work on different faces and with new products. Your favourite aspect? My job has taken me to places I never thought of going, and I love meeting different people and seeing their transformation after the makeover. It feels good that my handy work gives them confidence, it makes me feel like some sort of a healer to the ego! What don’t you like? People who have no respect for what you do. What hurdles have you overcome? There have been many hurdles along the way, especially being a freelancer. There were times when business was slow and I had to face the fact that I wasn’t getting a salary that month. I find the greatest hurdle is myself! I constantly have to battle with my mind and keep pushing myself to continue even when things are tough. I’ve had to train my mind to be positive and keep looking for new opportunities. What makes a ‘good’ make-up artist? People skills play a huge role. Make it a point to study people and treat them according to their personality. You need to be patient because you will encounter situations that don’t make you happy. You should also have a good sense of humour, and know when it’s time to talk and time to stop talking. Try to keep your client’s information to yourself. Respect for people goes a long way. What advice would you give a newcomer? Be patient and when work is slow, find models to practice on. Information is key, so stay informed. Market yourself to get your name out there. 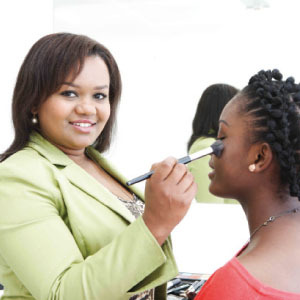 Most make-up artists start by taking a specialist course in make-up or beauty therapy and building up their practical experience. Building a work portfolio to show employers and networking with people in the industry is advantageous. Some get useful experience by working as a trainee with established make-up artists and photographers. They may also choose to refine their knowledge with a cosmetology degree. To start a successful make-up career in film or theatre, make-up artists may want to study a degree in fashion.